So, I decided to do an other book challenge this year. The starting date is maybe a bit late but that’s OK. This year, I want to do a reading challenge again not because I haven’t read any books but rather because I was too lazy to write some review/summary about the books I’ve read. In comparison to last year’s challenge where I read mostly business books, this year I will read mostly books about economics and statistics. You can see the preliminary reading list in the picture. Some books may change but the volume will probably be the same. 264 days and 25 books left. Let’s start! Hey, I was curious how you decided upon these 25 books? 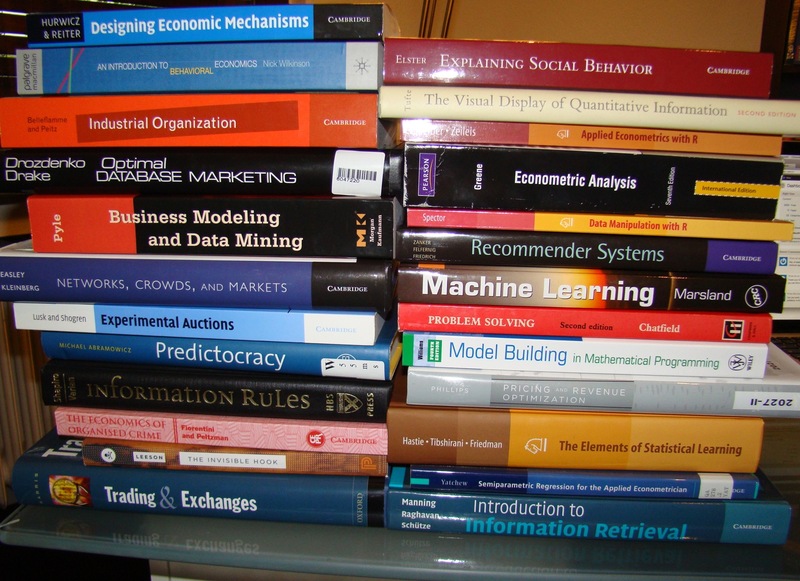 I also have a budding interest in finance and am looking for books that fall into the categories you’ve listed. Hi, good question. Most books of these books I collected over time but some good resources are Hackernews, Quora and various Stackexchanges. The only “real” finance book I listed is Trading & Exchanges by Larry Harris which mostly talks about market microstructures, i.e. “soft” stuff. If you are looking for books in quantitative (micro) economics, then I would start off with some basic books like Hal Varian’s Intermediate Microeconomics which is pretty basic but great if you never done economics before. Afterwards, get into game theory, Gibbon’s book is quite often used – if you want to be more on the computational side, you can take a look into Nisan, et. al. Algorithmic Game Theory. Afterwards, you can dive into books about mechanism design, Industrial organization, network economics, etc.